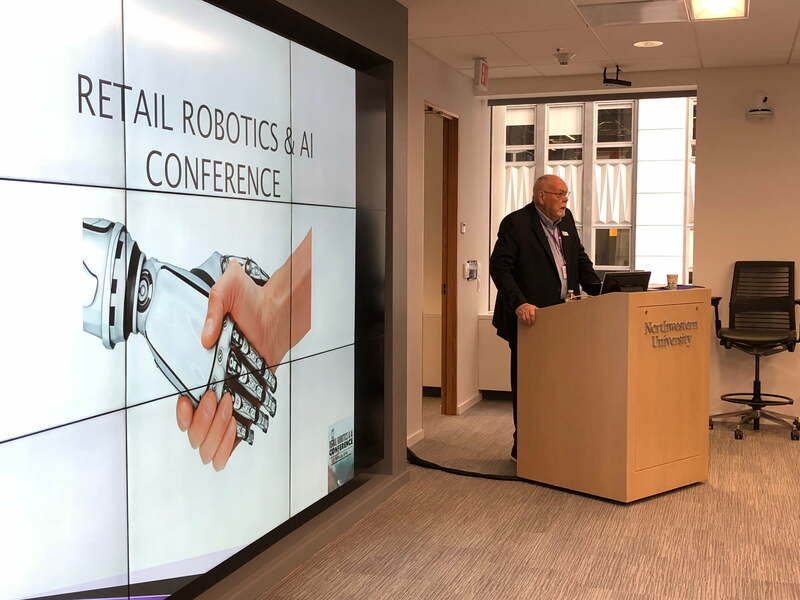 The Platt Retail Institute at Northwestern University kicked off its first conference on the topic of “Retail Robotics & AI” last week in San Francisco. RevTech was in attendance and was also a co-sponsor of the event. RevTech Mentor and Executive in Residence, Jeff Donaldson, was the first presenter, and provided a brief case study on Accel Robotics, a San Diego based company in which RevTech has an investment, and for which Jeff serves as lead mentor. Jeff described how Accel Robotics is continuing in its development of a consumer perception engine for automated store environments. Other speakers were a mix of industry luminaries and Northwestern research faculty. A couple highlights of the day were presentations by Deborah Weinswig and Clive Humby. Deborah Weinswig, CEO of Coresight Research (and a RevTech advisor), presented some stunning examples of retail in China, which is dominated by Alibaba and JD. Most astounding was the statistic that ecommerce transactions on Singles Day (i.e. 11/11) in China were more than 100x of ecommerce transactions in the USA on Cyber Monday. Clive Humby, co-founder of the grocery data analytics powerhouse, Dunn Humby, provided an overview of that firm’s original go-to-market strategy, which culminated in its sale to TESCO. He also shared what he called the “Seven Truths of Data” in an organization (see below). There were also some very interesting academic presentations, most notably from Mike Tamir and Martin Block. Mike Tamir, the head of Data Science at Uber Advanced Technologies Group, presented an amazing AI structure his team has developed for determining fake news content in national media. He went through a lengthy construct of the algorithm, then demonstrated it on several articles from major news organizations. Clearly, Uber must believe it is the victim of fake news attacks to have dedicated such significant resources to this project. Martin Block, the Executive Director of the Retail Analytics Council at Northwestern, provided some interesting stats of mobile engagement in the USA. He contrasted China, which has maintained a flat level of around 70% active mobile shoppers for several years, with the USA, which has seen active mobile shopper demographics grow from low 20% to 38% over the past few years. The suggestion was that our trend line is toward China’s 70%, but slower to develop (possibly because of the high level of mobile payments in China). Block also spoke to the major cultural shift underway in the USA from “spectator activities” (e.g. documentaries, talk shows, etc.) to “participant activities” (e.g. gaming, cooking, etc. ), and the implications this shift has on retail. There were a substantial number of retail industry influencers and decision makers in the room, and RevTech was pleased to be an integral part of the conference. Hats off to Meagan who ran the registration table and even had the opportunity to evict at least one non-ticketed attendee! Data is both art & science. Build a customer product hierarchy. Functional vs emotional engagement is the science of purchase and intent. Embrace agility & adaptability because data flows fast. Adopt a learning culture; insight alone doesn’t drive change. Continuous learning; adapt fast, learn to live with change. Make sure data has a place in the boardroom. Be goal-oriented & don’t lose sight of the low-hanging fruit.